Nearly 1,000 animals have so far been saved in what is being called the largest tactical strike on extreme animal cruelty operations in U.S. history. This week, authorities in Palm Beach Country, Florida, along with rescue group Animal Recovery Mission (ARM), launched a raid on three illegal slaughterhouses in the town of Loxahatchee. The action follows months of undercover investigations that revealed what might best be described as hell on earth. Warning: Contains graphic descriptions and video. "The animals on this property lived in deplorable structures and improper shelter. ARM investigators had never seen these animals fed or having food nor provided with clean water. The only food source they have available are intestines, blood and carcasses of newly slaughtered animals. Pigs have even been documented by ARM to be eating off the carcasses of hanging butchered animals, swarmed with flies and are awaiting customer sales." 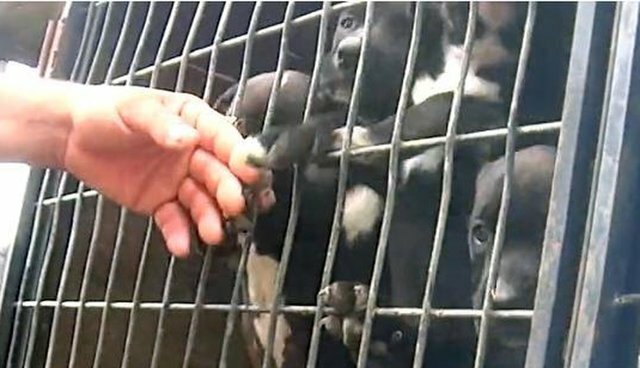 The facility was also host to a puppy mill, where young dogs were treated no better than animals raised to be killed. Conditions at the two other nearby facilities raided this week, G.A. Paso and Medina Farm, were equally as sickening. Investigators observed there, among other acts of cruelty, animals being boiled or skinned while still alive. "As occurs on many illegal slaughter farms, the methods to butcher the animals were executed in some of the most imaginable fashions," ARM wrote online. Operations are still underway to remove the survivors from the three slaughterhouses. So far, around 750 have been transported to safety. Garcia, Edgar Bica Sr. and Edgar Bica Jr., along with three others connected with the case, have all been arrested on various felony charges for animal cruelty and unlicensed sale of meat, and their operations have been shut down. This recent raid comes less than a year after another high-profile illegal slaughterhouse case in Florida, led by ARM founder Richard Couto. In that operation, more than 9,000 animals were rescued from Coco Farms, described at the time as the "worst torture operation" in the country. Despite these recent raids shutting down cruelty operations, there are still many others that need to be stopped. "We have a hundred farms that we're just waiting for the manpower to stop right now," Couto told The Dodo last March. "There are probably over 500 of these farms in the state of Florida. There are certainly small farms like this found throughout the country, but in Florida, it is a full-blown industry. It is millions and millions of dollars. This is organized crime."